Found 37 holiday rentals in Dubai. This 5 bedroom apartment with swimming pool is located in Dubai and sleeps 6 people. It has WiFi, parking nearby and air conditioning. This property can sleep a maximum of 10 persons. It has 4 bedroom/s and a single bed/maids room with 2 Double Bed/s and 6 Single Bed/s. Private 4 bedroom villa on Palm Jumeirah with private pool and private beach area. This signature 3 bedroom apartment located on Jumeirah Beach Residence (JBR) sleeps upto 9 people. A well appointed Dubai Holiday Rental Villa located on the private beach shores of the Palm Island Jumeirah. With so much space to enjoy where will you choose to relax on your next Dubai holiday? Signature 6 bedroom villa property on Palm Jumeirah, Dubai. Accommodation for upto 12 guests with private beach area. Fantastic villa home on The Palm Jumeirah, Dubai. Luxury designed property perfect for family/friendly vacations with private swimming pool and beach area. Riverdance is a truly stunning large 5 bedroom signature holiday villa in Dubai. Spacious 4 bedroom villa at Garden Villas, The Palm Jumeirah. This villa sleeps 10 guests and has beautiful private gardens. Penthouse in the Princess tower. 4 bedroom apartment with full view of the Arabian Gulf and of the world-famous Palm Jumeirah Island. BEACH FRONT 4 bedroom villas on the Palm Jumeirah Island! With the Dubai Atlantis Hotel just minutes away, this elegant beachside villa with its delightful garden, tranquil views, and palatial style interior is perfect for families, couples and groups of friends. A large Penthouse holiday apartment located on Dubais Palm Island Jumeirah. Relax in the spacious living rooms, have a little competiton with your friends at the pool table, or enjoy the large rooftop sun terrace. This SIGNATURE Dubai apartment (3 bedrooms) offers amenities such as pool, children's play area, gym, entertainment lounges, courts, coffee shops and steam rooms. Close to the financial district and the exhibition centre. Luxury 3 bedroom apartment with sea views in Jumeirah Beach Residence, Dubai. Ideal for a large family or group of friends, located on the Jumeirah Beach Walk the heart of Dubai's seafront activity. We recognize our market is forever changing and we pride ourselves in constantly creating impressive new services to exceed our client`s expectations and more. This Villa will always ensure your experience was one to remember. The beautiful and spacious 4 bedroom villa with private beach and private swimming pool features fascinating views of the Palm Island and the Arabian Ocean. Magnificent modern villa property on the amazing Palm Jumeirah, Dubai. Family/friendly self-catering accommodation for 14 guests with private beach area and sea views throughout the property. Located on the Palm Jumeriah Island. Enjoy the sea views from the balcony of this spacious Dubai Self Catering Apartment. This Dubai furnished apartment provides easy access to idyllic parks, cinema, shopping areas & restaurants. This spacious SIGNATURE Dubai furnished apartment on the Palm Island Jumeirah Shoreline trunk. 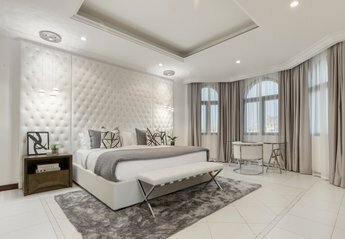 Fully furnished this luxurious Dubai apartment also offers Plasma TV, PC and wireless internet and is ideal for both business and leisure travelers. A PLATINUM luxury 4 bedroom apartment for rent in Dubai, on the 27th floor of Horizon Tower, located at Dubai Marina. A spacious Dubai furnished apartment located next to the popular Jumeirah beach. This furnsihed apartment is ideal for large families and groups, fully equipped and serviced for your short stay in Dubai. If your looking for lots of space right on the beach then this Palm Island Signature Villa is the best choice. With 2 living rooms and huge sleeping spaces theres more than enough space for upto 13 guests. Beachfront holiday apartment at Dubai Palm Jumeirah. Enjoy your Dubai short stay in luxurious surroundings and plunge into the delights of sun, sea and sand of Dubai and become a part of royalty and beauty of this 8th wonder of the world. This spectacular 3 bedroom Dubai self catering apartment captures the essence of beach lifestyle living. Enjoy sparkling swimming pools, with separate children's pool area, children's play areas, pool bar and gymnasium facilities. Stunning 5 bedroom villa property on The Palm Jumeirah, Dubai. Holiday home perfect for up-to 10 guests with luxury interiors, private swimming pool and private beach space. 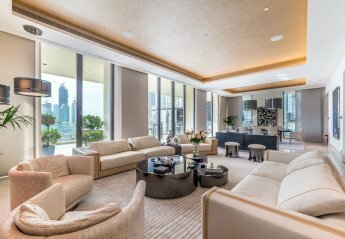 This beachfront 3 bedroom apartment in Jumeirah Beach Residences offers ample space for up to 9 persons and is perfect for short or long Dubai stay. We found 37 holiday rentals in Dubai.